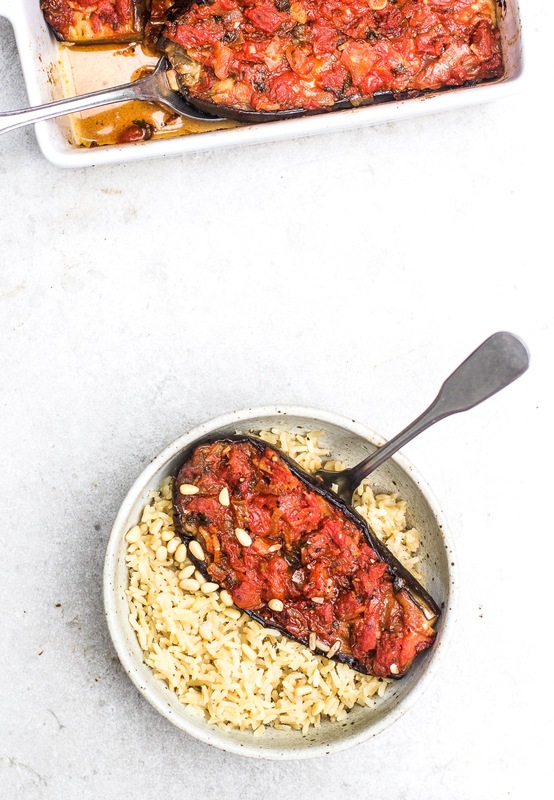 This aubergine imam is inspired by Greece, it’s one of my favourite things to eat when I’m there. It’s a little different in every restaurant but always has the same melt in the mouth deliciousness that’s hard to beat. Serve it as a side or as a main and make sure to spoon any of gorgeous the juices over before serving. Add 2 tablespoons of olive oil to a large pan on medium high heat. Chop the stalks off the aubergines and cut them in half lengthways. Add them to the hot pan, skin side down and cook for about 3 minutes, then flip and cook for another 3 minutes. While they’re cooking, dice the onion and mince the garlic. 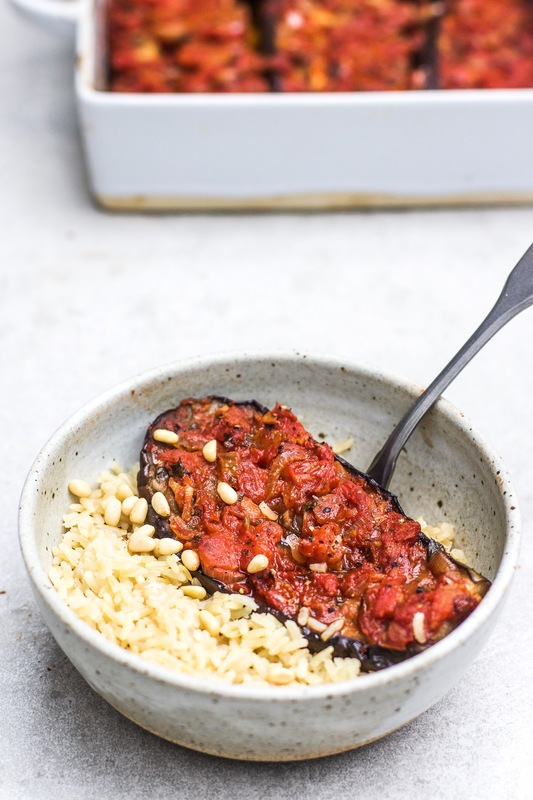 Place the aubergines skin side down into a baking dish- make sure it is not too big, you want them to be snug. Add the rest of the olive oil to the pan and turn the heat down to medium. Add the onion and cook for a few minutes until soft and sweet. Then add in the garlic and cook for a minute, tossing often. Sprinkle in a pinch of cinnamon and toss well. Add in the parsley and tomatoes and stir until heated through. Season well with salt and pepper to taste. Slit the aubergines down the centre, don’t go through to the skin. Pile the tomato sauce over them and spread it out evenly. Cover the dish with tinfoil and cook for about 90 minutes, or until totally tender. Serve with the gorgeous juices spooned over the top.